Autism is an issue that cannot be ignored — it is the fastest growing developmental disability, according to the Centers for Disease Control and Prevention (CDC). In fact, during the years 2000 through 2010, the prevalence of autism in U.S. children increased by 119.4 percent, and today, one in 68 children has autism. LaBarbera decided to write a book to give the subject the respect it deserves and to encourage future teachers of its importance. “The struggles that parents face touched my heart. Teachers and parents collaborating is a best practice (and a legal requirement) in servicing special needs students,” said LaBarbera. 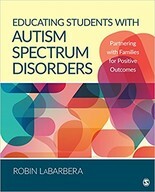 She plans to use her new book, Educating Students with Autism Spectrum Disorders: Partnering with Families for Positive Outcomes, which publishes January 2018 as a textbook in her spring 2018 classes. The book focuses on practical educational strategies for the classroom, with additional features including case studies based on real interviews with parents and educators. LaBarbera developed a heart for those with autism when she created the School of Education’s online Preliminary Education Specialist Instruction Credential (Mild/Moderate). The credential provides enriching field experiences combined with dynamic online instruction to prepare candidates for successful entry into the field of special education. Biola’s School of Education also offers a master’s of science in special education. Designed for individuals seeking to work with students who have mild to moderate learning, emotional and intellectual disabilities, the program requires students to participate in faculty-led research teams and contribute to publications for peer-reviewed journals. LaBarbera serves as an associate professor and director of special education in the School of Education. She has conducted numerous local and international presentations, in Lebanon and Vietnam, published articles related to the education of students with learning difficulties, and co-authored curriculum for English language development in Latin American countries. Learn more about Biola’s Special Education (Mild/Moderate) credential program. Learn more about Biola’s Master of Science in Special Education program. Written by Lori Mann. For more information, please contact Media Relations at media.relations@biola.edu.